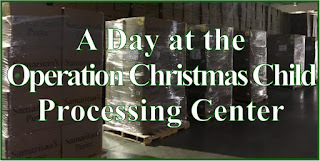 I'm about to head out to hit the after Christmas clearance...it's the most wonderful time of the year!!! 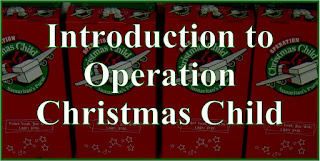 Below is what I got for my Operation Christmas Child shoebox stockpile last week. I took advantage of the free shipping day and I $5 Sports Authority gift card I'd gotten as a reward and thought I'd never use to get these cute hats on clearance for just $1.34 total including tax!. 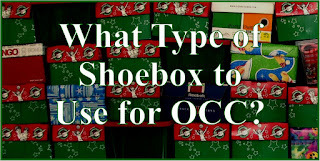 Perfect for my aunt's 2-4 year old boy shoeboxes! These are some things my mom got for Christmas some specifically bought for shoeboxes as she'd requested and some things she got and thought would be cute in in shoebox, so she'd share it. From Dollar General-everything I got was $0.50...coloring books, pens, pencils, stickers, & playing cards. That is an averaged sized box, and there's still a good amount of room on top to add supplies, stuffed animal, etc. From Walgreens, I know these will probably go more off, but like to have candy canes for my shoeboxes and they often aren't available around here before we pack, and the big ones I got last year were hard to fit in, and I had a Walgreens gift card. 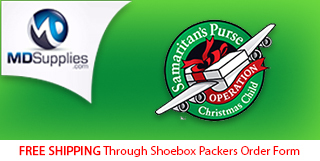 UPDATE 2017: Candy is no longer allowed in Operation Christmas Child shoeboxes. From Office Max-the free after rewards battery deal again. From Big Lots-a couple tins to pack in inside the boxes, thought it'd be cute, plus good for the kids to store in, plus it has a penguin, and I like penguin themed shoeboxes as you may have noticed...one was $1, the larger was $1.50. Plus my mom and sister crocheted 18 more Aunt Ida hats. 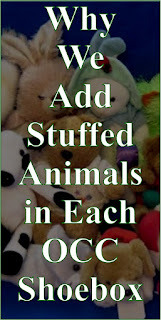 You may be interested to read Why We Include a Stuffed Animal in Each of Our Operation Christmas Child Shoeboxes. 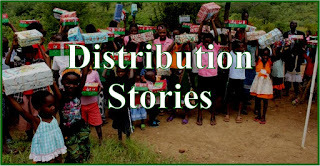 If you've been following Simply Shoeboxes on Facebook, you may have seen my "Throwback Thursday" posts of Operation Christmas Child shoeboxes I've sent over the years. I thought I'd share some on here for those of you not on Facebook. I thought now, before, the after-Christmas-clearance (that I really hope to hit) in case they inspired anyone else. 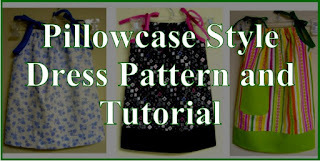 I love making themes around clearance items-save money AND have themes! NOTE: In the USA starting in 2017 we need to not send candy or toothpaste anymore, these are from past years when those things were okay. 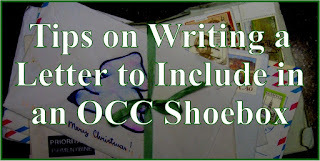 When I make a themed Operation Christmas Child shoebox, I don't leave out anything on my list-I still put in hygiene, school, and art supplies, as well as toys including a ball and stuffed animal. 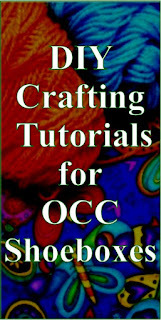 I just try to find versions of what I'm putting in that goes with the theme and occasionally an extra item or two. 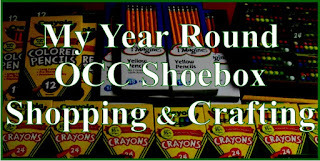 Please note that these are from past years before Samaritan's Purse was really emphasizing to pack standard sized shoeboxes, so a few of these may be in larger boxes then I would send with what I know now, and some may have less then I'd send now or that year's list of basic items I planned to pack might be different than this year's...I view OCC shoebox packing as a journey where I'm always trying to learn more about how to pack the most fun and useful box possible. 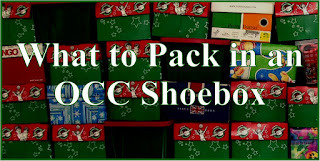 I decided to share each week at "Operation Christmas Child Shoebox Stockpile Saturday" what I've added to my stockpile lately via purchases, crafting, and donations. My mom and sister also crocheted 11 Aunt Ida hats! 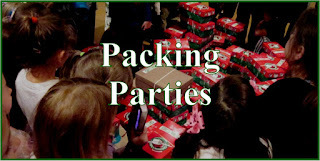 We have shared several ideas on Operation Christmas Child Shoebox Stockpile Organization if you are interested in seeing how we keep track of what we buy throughout the year. UPDATE 2017: No candy or toothpaste allowed. 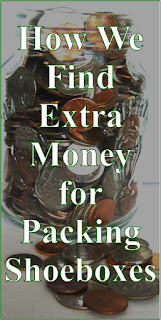 I've been trying to get organized for shopping for next year's Operation Christmas Child shoeboxes we will be packing. 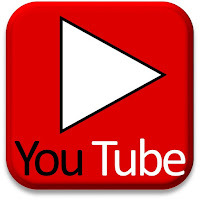 I still need to do a little more work on the organizing of the stock before I post on that...I'll edit this post when I do so to give the link for that. But I did make a tentative list of what we need to shop for/are planning to pack, and thought I'd share it in case anyone was interested.